I walked out of my classroom for the last time today, and I feel like a huge weight has been lifted off my shoulders. Partly I'm sad because I love teaching and I love my students, but I'm getting over it faster than I expected. In fact, I'm feeling more hopeful than anything. I know that not everyone is in the position that I am in, where I can walk away from my career and start over, and I am very thankful that I can do this. That being said, I do still need to find a job. The way our district pays teachers, our salary is spread out over twelve months so that we still get a paycheck in the summer, although that money was already earned during the school year. Knowing that I still have three paychecks left helps, but that isn't stopping me from starting to look now. And if something comes up now, I am going to jump on it. In the meantime, I have a crazy list of things I want to accomplish with my time as an unemployed individual. Starting with this. 1. Find something to do with all this stuff I brought home from school. Believe it or not, I gave most of the stuff in my classroom away. Good stuff too, but hey, I'm never going to use it again. There was no way I could bring it all home because I don't have anywhere to put it. As witnessed by the above photo of mostly office supplies (remember my obsession). I'm taking this opportunity to pull everything out, purge, and reorganize. 2. I'm going paperless. I'm on a mission. I'm going to get rid of my filing cabinets and keep everything in the cloud. I've already started, and I've been scanning and shredding papers like a mad woman. Towards that end, this is what Peanut Head got me for Mother's Day. I seriously love this thing because it's compact and it works. 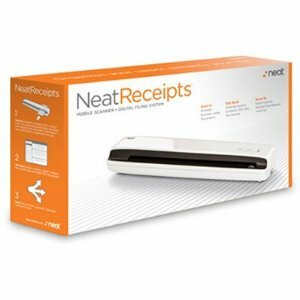 It's powered by a USB cable and it comes with software to organize all your paper. It can do full-size documents too, not just receipts. Today I scanned in our 25-page homeowner's insurance policy. Why so much paper? Paper stresses me out. So does my e-mail, but don't get me started on that mess. 3. My house is in serious need of decrapification. Six years of overly relaxed housekeeping standards, and four people living in it, has my house ready for an episode of Hoarders. 4. I'm going to take care of myself. I feel like an elderly Blow Fish. I feel icky, my clothes don't fit, and I'm uncomfortable all the time. I've spent the past six years in a constant state of anxiety which is not a very hooty place to focus on my health. I rarely exercise. My menu planning has gone out the window, and we eat out way too much. I'm tired of feeling like this, and I will not wear elastic waist pants! 5. I'm going to put the focus back on my family. When I teach, my life revolves around that. It always has. I have proved myself incapable of putting myself or my family first when I am responsible for others' kids. Therefore, if you can't take the job out of the teacher, then you take the teacher out of the job. So as you can see, my usual teacher summer of sitting on my couch eating Bon Bons has been hijacked by "The Plan." Stay tuned . . .
Good for you! Your story resonates with me because I struggled with the same things. And I walked away I gave away a lot of my stuff. I stored a lot of it, too and just last fall boxed a majority of it up and took it to Goodwill. I've been a SAHM for the past almost 14 years. But last fall I got a part time job working in an elementary school kitchen. I work about 4-5 hours a day. It's physical and I lost some weight after I started (whoo, hooo). I am able to be at home when the kids get home. If you don't have to work full time, it might be something to consider. The draw back is you don't get paid for the summer. In my district though, they have a free summer lunch program that one can apply to work for. The best part for me is I get a little interaction with kids, but when I walk out at the end of my shift I'm done until the next day. :) Win, win! I hope you have an awesome summer and start to feel better about everything! Thanks, Jeanne. 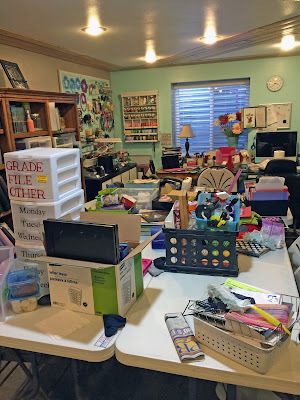 I purposely chose NOT to store my stuff so that I wouldn't be tempted to go back to teaching. I'll probably end up in an office somewhere, but I'm keeping my options open. Congrats! I was worried that you might stop blogging, but it sounds as if you'll have plenty to share with us! This sounds like a great plan! Better to stay busy and catch up on your life while you can! 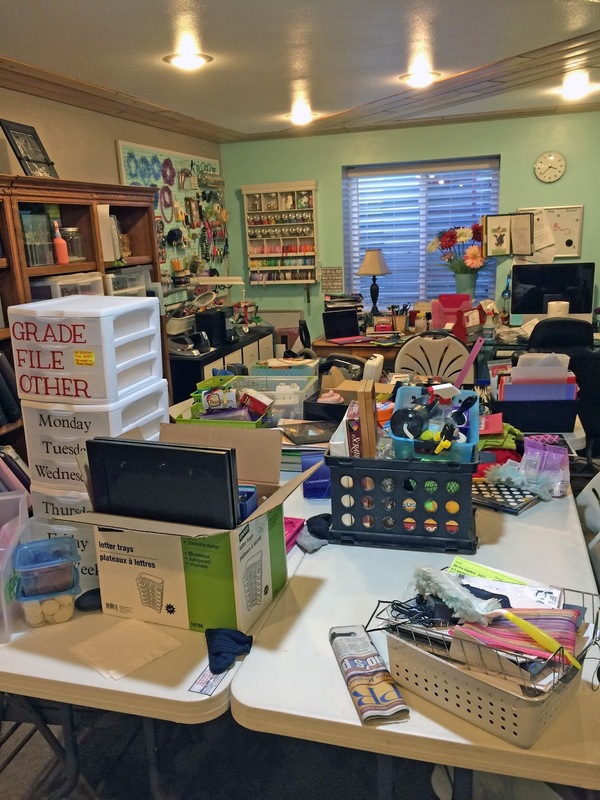 I am sad to see your classroom so empty and overwhelmed at your home office but oh how I wish I could be a fly on the wall and watch you organize it! What about tutoring or subbing? No kidding. When I have time, I waste time. I was sad to see my classroom empty too. It's depressing without all the stuff. I'll make sure to post updates on my progress. I've thought about tutoring, but it's not the same. Subbing is my worst nightmare. You should never say never though. Love your plan, hopefully you can stick to your plan better then hubby and I have stuck to ours since retiring 5 years ago. Good luck in finding another job, will you be looking for a full time or part time job. Bernice, we have a goal of putting our house on the market by fall, so hopefully that will keep us focused and on target. I'm looking for full-time work. I'll keep everyone posted on my progress. It feels good to blog. Thank you, Emily. I haven't completely left education. This year I'll be working as a Math Specialist in my district, but without the stress and commitments of a teacher. Perhaps with this break I'll be able to step back into my own classroom again. So much excitement in store for you this summer! I'm glad you're still blogging too. I love hearing about your adventures! Thanks, Kristi. I have to admit, this has been the best summer ever without obsessing about getting myself and my classroom ready for the new school year. I am so proud for you. I resigned last May myself for your very same numbers 3,4,5, and 6! I had the exact same experience. I miss the kids, but the rest is just not miss-able! I wish you a bucket of happiness, joy, peace, and the ability to breathe. Be Blessed! Thank you! You didn't mention what you are doing now. I'm curious. 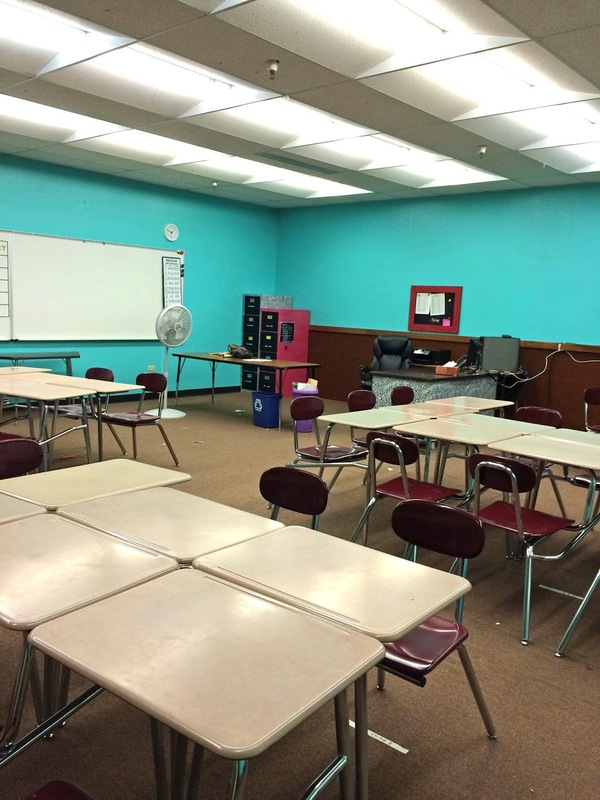 Here I just found your wonderful blog while looking for your new classroom tour! I find myself back in the classroom after our district closed the middle school libraries. I am loving the classroom, but I totally get the exhaustion. I am wondering if I can make it 5-10 more years until retirement. I wish you the best for your future. I hope you leave your blog up so I can go back to it for past teaching tips and I look forward to reading about your new life! Leslie, I fully intend to leave my blog up. It was never a teacher only blog, so I will just continue as usual, although it should be more often now. I know of quite a few librarians who have found themselves back in the classroom. You can make it 5-10 more years, but you have to pace yourself. Good luck!